Miss Rosie Eskew was the guest of Mrs. Josie Towery Saturday and Sunday. Glen Eskew went to Marion Monday. Source: Crittenden Record-Press. (Marion, Ky.) 1909-1918, January 12, 1911, Edition 2, Image 8 - Chronicling America - The Library of Congress. Source: Crittenden Record-Press. (Marion, Ky.) 1909-1918, January 19, 1911, Edition 2, Image 3 - Chronicling America - The Library of Congress. Gren [Glen] Eskew was in Marion Wednesday. Source: Crittenden Record-Press. (Marion, Ky.) 1909-1918, January 19, 1911, Edition 2, Image 8 - Chronicling America - The Library of Congress. Eskew Brothers Open Branch Establishment. 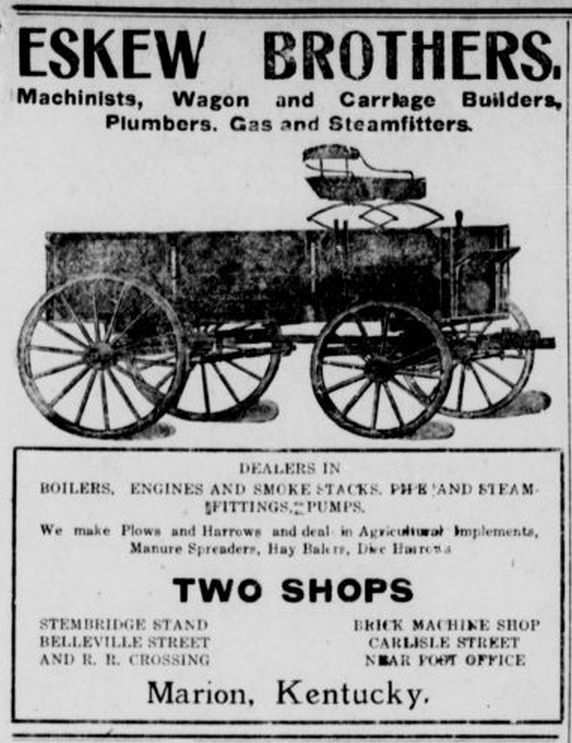 No one who knows the Eskew Bros., will be surprised to learn that they have bought the Stembridge wagon works and machine shops on Belleville street recently operated by A. J. Stembridge, who relinquished it only because of a lack of capital to operate it successfully. 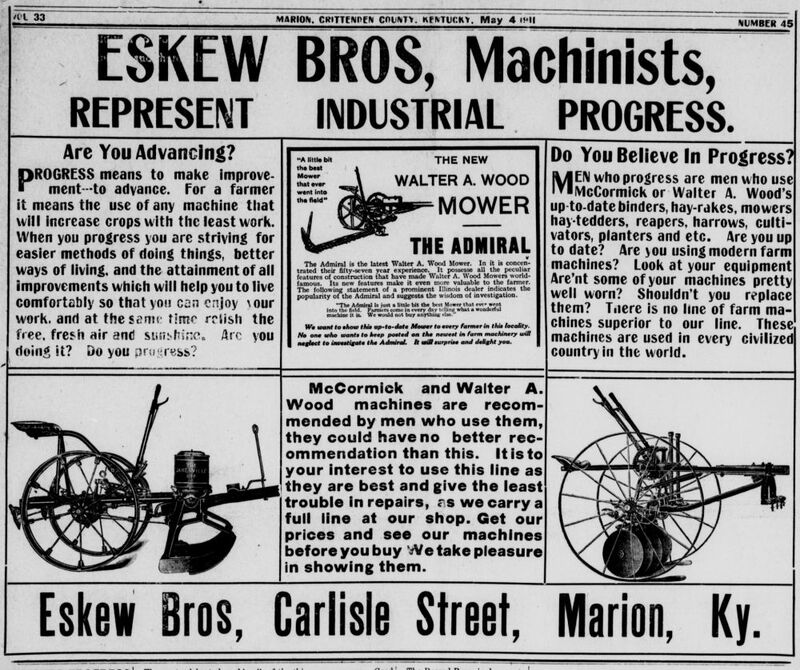 The Eskew Bros., who are noted for their thrift, industry and enterprise will put the new branch under the charge of L. J. Randolph as foreman and Myron Frisbie as Master Mechanic, steel workman wagon builder and carriage maker. This certainly insures the patrons of this shop with work of the highest class and they can depend on finding here also a horse-shoer of national reputation. The wagon manufacturing will be pushed. Their [sic] is room for it here. Marion above all things needs factories. The great Studebaker began his career in a much less pretentious shop and now their products are sold in all parts of the civilized world and it is truthfully stated that the sun never sets on the British Empire or the Studebaker wagons. Give Eskew Bros. the home support they deserve and they will surprise you in a short time with their new wagon works and machine shop. Source: Crittenden Record-Press. (Marion, Ky.) 1909-1918, February 2, 1911, Edition 2, Image 1 - Chronicling America - The Library of Congress. Glenn Eskew was in Marion Wednesday. Source: Crittenden Record-Press. (Marion, Ky.) 1909-1918, February 2, 1911, Edition 2, Image 8 - Chronicling America - The Library of Congress. Mrs. Annie Hardin was the guest of Mrs. Alice Eskew last week. Source: Crittenden Record-Press. (Marion, Ky.) 1909-1918, March 23, 1911, Edition 2, Image 8 - Chronicling America - The Library of Congress. Source: Crittenden Record-Press. (Marion, Ky.) 1909-1918, March 30, 1911, Edition 2, Image 4 - Chronicling America - The Library of Congress. 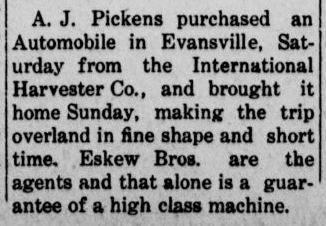 A. J. Pickens purchased an Automobile in Evansville, Saturday from the International Harvester Co., and brought it home Sunday, making a fine trip overland in fine shape and short time. Eskew Bros. are the agents and that alone is a guarantee of a high class machine. Source: Crittenden Record-Press. (Marion, Ky.) 1909-1918, April 6, 1911, Edition 2, Image 5 - Chronicling America - The Library of Congress. Mrs. Nancy Caroline Eskew, who has been an invalid for three years at which time she was stricken with parallysis from which she never recovered, died at the home of her daughter, Mrs. E. F. Coleman, near Shady Grove Friday, April 7th, 1911, in her 67th year, having been born July 11, 1844. The interment took place Saturday at the Simpson Graveyard and her remains were laid beside those of her husband, the late A. J. Eskew, who preceded to the grave only a few months ago Rev. I. W. Tolley [Talley] officiating. Mrs. Eskew had been a member of the Walnut Grove Baptist church for many years, she was born in Warren Co. Tenn. and her husband in Wilson Co. Tenn. and both moved here in their youth, and soon after their marriage settled on the farm near Shady Grove where they spent the remainder of their lives until three years ago when they moved here. After her husband's death last winter she went to live with her only daughter, Mrs. E. F. Coleman. She is survived also, by four sons, M. O., Jno., Andrew, and Harvey all of this city, she has living, also, five brothers, R. W. Vanhooser, of this county; Thos. and A. J. of Caldwell Co., John of McMinnville Tenn; and James of Missouri. Source: Crittenden Record-Press. (Marion, Ky.) 1909-1918, April 13, 1911, Edition 2, Image 1 - Chronicling America - The Library of Congress. Source: Crittenden Record-Press. (Marion, Ky.) 1909-1918, April 13, 1911, Edition 2, Image 2 - Chronicling America - The Library of Congress. Source: Crittenden Record-Press. (Marion, Ky.) 1909-1918, April 13, 1911, Edition 2, Image 3 - Chronicling America - The Library of Congress. Mrs. Eskew, wife of the late Jack Eskew, died Saturday. She was in her sixty-fifth year of her age and had been an invalid for several years. She was a bright and noble Christian woman highly respected and was loved by all who knew her. 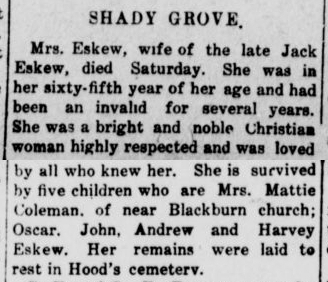 She is survived by five children who are Mrs. Mattie Coleman, of near Blackburn church; Oscar, John, Andrew and Harvey Eskew. Her remains were laid to rest in Hood's cemetery. Source: Crittenden Record-Press. (Marion, Ky.) 1909-1918, April 13, 1911, Edition 2, Image 8 - Chronicling America - The Library of Congress. Source: Crittenden Record-Press. (Marion, Ky.) 1909-1918, May 4, 1911, Edition 2, Image 1 - Chronicling America - The Library of Congress. Jno. W. Wilson and Jno. Eskew have purchased a new Ford automobile and have accepted the agency for this place for the General agents Foreman and Co. of Paducah Ky. Source: Crittenden Record-Press. (Marion, Ky.) 1909-1918, May 18, 1911, Edition 2, Image 5 - Chronicling America - The Library of Congress. Oscar F. Towery and G. Eskew were in Marion Tuesday. Source: Crittenden Record-Press. (Marion, Ky.) 1909-1918, May 25, 1911, Edition 2, Image 3 - Chronicling America - The Library of Congress. Friday morning, John Eskew, with his chaffeur [sic], Mr. Estes, took J. 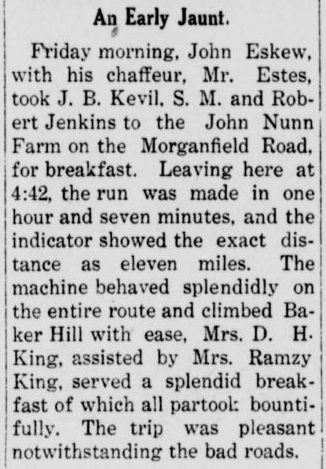 B. Kevil, S. M. and Robert Jenkins to the John Nunn Farm on the Morganfield Road, for breakfast. Leaving here at 4:42, the run was made in one hour and seven minutes, and the indicator showed the exact distance as eleven miles. The machine behaved splendidly on the entire route and climbed Baker Hill with ease, Mrs. D. H. King, assisted by Mrs. Ramzy King, served a splendid breakfast of which all partook bountifully. The trip was pleasant notwithstanding the bad roads. Source: Crittenden Record-Press. (Marion, Ky.) 1909-1918, May 25, 1911, Edition 2, Image 4 - Chronicling America - The Library of Congress. Source: Crittenden Record-Press. (Marion, Ky.) 1909-1918, May 25, 1911, Edition 2, Image 8 - Chronicling America - The Library of Congress. Mesdames John Wilson, James Henry and Miss Nelle Olive attended the 'Home Ties' performance at Fredonia. They drove over in Wilson & Eskew's automobile in thirty-five minutes. Source: Crittenden Record-Press. (Marion, Ky.) 1909-1918, June 1, 1911, Edition 2, Image 5 - Chronicling America - The Library of Congress. Judge John W. Blue, County Attorney John Moore and John Eskew of Marion, motored to this city Thursday on business. Source: Crittenden Record-Press. (Marion, Ky.) 1909-1918, June 6, 1911, Edition 2, Image 1 - Chronicling America - The Library of Congress. John Eskew, wife and child, Walter Neal and wife, of Marion, were here Sunday. Source: Crittenden Record-Press. (Marion, Ky.) 1909-1918, July 13, 1911, Edition 2, Image 6 - Chronicling America - The Library of Congress. 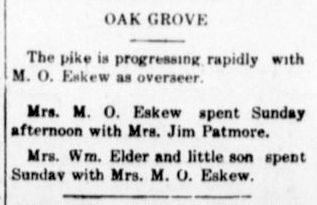 The pike is progressing rapidly with M. O. Eskew as overseer. Mrs. M. O. Eskew spent Sunday afternoon with Mrs. Jim Patmore. Mrs. Wm. Elder and little son spent Sunday with Mrs. M. O. Eskew. Source: Crittenden Record-Press. (Marion, Ky.) 1909-1918, November 30, 1911, Image 8 - Chronicling America - The Library of Congress.